Is it a sandwich? Is it a burger? That's probably the least important question concerning the Surf & Turf Burger at Manhattan's Pounds & Ounces. 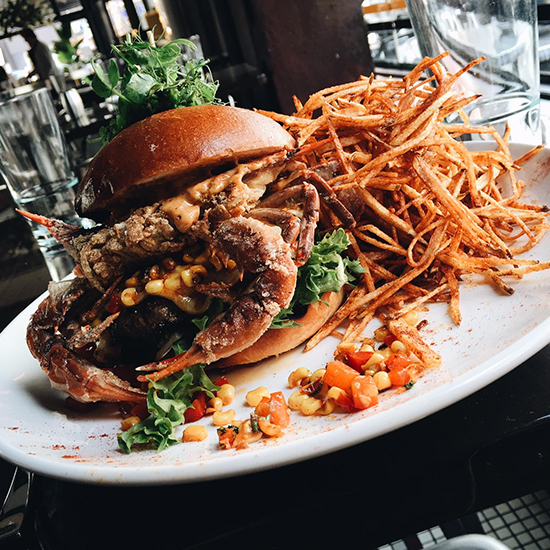 You've got a massive soft-shell crab—just look at this thing trying to claw its way off the bun—Cajun-spiced and fried 'til crisp. Not to be outdone, it's sitting on an eight-ounce beef patty, itself draped in white cheddar. If there’s one thing better than crab on a hamburger it’s crab on a cheeseburger, clearly. The bread: A soft, squishy bun that's sturdy enough to support the groaning weight of crab and burger. The filling: Along with that fried-up soft shell and sizable burger, you've got white cheddar melted on top, char-grilled corn salsa, remoulade, and lettuce—you know, to make this thing healthy. Fork and knife not only recommended, but required. Is There a Sandwich Better than an Uni Sandwich?